"We started in the end of 1991. 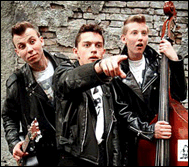 In that time almost no one in Ukraine was aware about existence of rockabilly music, except maybe some 50's rock'n'roll. There were a couple of bands of that kind in another big Ukrainian town Kharkiv, and completely no scene in Kyiv (our city, the capital) or anywhere else. The word 'rockabilly' itself was a mystery for the most of the people around here, not talking about neo/psychobilly stuff. We played for all kinds of crowds wherever we could, bringing this new type of music to the people, feeling ourselves real aliens with the double-bass, semi-acoustic guitar, stand-up drummer, shocking haircuts and clothes, English lyrics, lots of screaming and wild style in general. As musicians, we were absolute beginners, our playing and composing abilities were poor, but we were full of inspiration, teen energy, and sick of any pop music. Our first line-up consisted of myself, Vladimir 'Stalik' Stalinsky on upright bass and Roman Sharkevich on drums. The very first MAD HEADS gig happened on 8 December 1991. It was a small underground concert where we succeeded to deeply impress a bunch of hippies. Stalik was so enthusiastic and inexperienced in the same time, that his right hand (slapping) fingers were bleeding far before the end of our performance, spraying blood over the nearest people in the audience. During 1992, we performed as often as we could. We started with self-organized parties in the cellar (in the winter time) and on the roof (in the summer) of a multi-storey house in our neighborhood, we ended up on the stage of a rock-festival among the best underground acts in our city. We also played our first gig out of Kyiv - in Kharkiv, where we were happy to share the stage with another rockabilly band. Our repertoire was a mix of own songs, 50's rockabilly classics and some neo/psycho favorites; and we were recording many demo tapes during rehearsals. We met for rehearsals no less then twice a week at my or Roman's place, bringing joy and happiness to our neighbours (especially to the most nervous ones) as long as we all lived in the blocks of flats. Towards the end of 1992 we had our first studio session. A six track demo tape had been sent to the only record label's address that we had, to NERVOUS RECORDS (UK). As a result, we were proposed to re-record two tracks for the punk/psychobilly compilation, which was released a year later on RAGE RECORDS (Nervous sub-label). In 1993, the line-up changes started. It was a big slow-down for the band that already built up some reputation in the rock scene of Kyiv. Our original drummer left, we were trying several others and ended up with Eugeniy Medved who was still not quite what the band needed. Then Stalik moved to Germany (marrying a girl there), so we had to look for another double-bass player or rather for a guy who would have liked to learn playing bass (Stanislav Lisovsky). It was a real problem to find new rocking musicians in the town where nobody knew this kind of music. The band was paralyzed; we did less than ten gigs in a year and a half. However, I kept writing new songs. Finally, in the summer of 1994 Bogdan Ocheretyany joined as a drummer, and the things went much better. Bob was 16 by that time; he played pretty good and was very enthusiastic about the music. We started to perform quite often, once opening for a major rock band from Russia, many times on the local rock festivals, later also in the nightclubs. We recorded a lot of demo stuff and started bombing all possible European rockabilly/psychobilly record labels with our tapes. One of them was CRAZY LOVE RECORDS (Germany), who signed us. One more thing to mention, we joined our efforts with Ivanna Dovzhenko, who became the band manager and played an important role in the development of the band's career for the next three years (we went on to be self-managed afterwards). In 1995, we released a six-track cassette EP 'Mad Heads Boogie'; the limited addition of 200 was sold out in two weeks. By then, we already were able to attract a crowd for a solo concert, started appearing on national and commercial TV and radio channels, in major news papers and music magazines, gaining more audience and inspiring some new bands. We began to tour around Ukraine and by now played in most of the major cities, also in some of the smaller ones. In 1996, our first album 'Psycholula' was released on CD by CRAZY LOVE in Germany, and on cassette by a local label WESTERN THUNDER. We were not satisfied with our double bass player and my brother Maxim replaced him. Max was only fourteen at that time, but he was much better from the very beginning. In 1996 we shot our first real video clip for a TV promotion, to support 'Psycholula'. That year we played in Russia for the first time, in St. Petersburg on the festival organized by MEANTRAITORS. Then we played in Moscow for many times, in some other Russian towns as well, but St. Petersburg remains a very special place for us, with a great spirit and great audience. We keep going there about once a year, playing numerous gigs in the rock'n'roll clubs. The local label there even released live 'Chernobilly Attack' on a cassette in 1997. That same year we played outside former USSR for the first time - in Finland, on a great festival 'My Way Rock'n'Roll Jamboree'. It was a big week-ender with a crowd of near 2,500 people and 21 bands including METEORS, NEKROMANTIX, RESTLESS, MATCHBOX and CRAZY CAVAN. 1997 was also successful at home. We filmed a couple of new videos, appeared at some top TV shows, and performed a lot. At the end of the year Mad Heads were elected one of the five best Ukrainian rock bands. Another important event for the year 1997 - in July we have had our first site in the Internet, originally created and maintained by Maxim Sergiyenko. In 1998 we finally got to Western Europe. We played at 'Calella Psycho Meeting' in Spain, in the legendary Charlotte pub in England, then in Finland for the second time. Some of our new songs were included to several compilations out in Ukraine, Russia, Germany, USA and later even in Japan. Then in November we released a new album 'Mad In Ukraine'. It was out on CRAZY LOVE RECORDS, but there is also a Ukrainian CD and cassette release, and a Russian cassette release as well. The year of 1999 brought us more gigs and TV appearances at home as well as new trips abroad. We played two festivals in Germany and one in Spain (our sea-side favorite, psychobilly meeting in Calella). We also stormed a few clubs in Russia and Poland. The year 2000 saw us at the millennium party in the Razzle Dazzle club in Berlin. Then there were two more festivals plus other gigs in Switzerland, Germany, Holland and Poland, not mentioning many gigs in Ukraine and the large live appearance on the 1st National TV channel in the end of the year. Recently, we were lucky to play and record the music we really like for the people who enjoyed it internationally. We also had a great pleasure of sharing the stage with many excellent bands including the most famous ones in the scene, like REVEREND HORTON HEAT, METEORS, BATMOBILE, NEKROMANTIX, DEMENTED ARE GO, RESTLESS, FRENZY, SHARKS and just more, more, more. We've met lots of interesting people, got in some adventures, drunk lots of beer and had lots of fun. So let's keep rocking!"